General Hospital Rumors: Kevin and Ava Have A Pretend Romance To Draw Ryan Out Of Hiding? General Hospital spoilers tease that Ava Jerome (Maura West) will have to round up a temporary boyfriend who will be believable enough to draw Ryan Chamberlain (Jon Lindstrom) out of hiding! In a recent General Hospital episode, Ava, Mayor Laura Webber Collins (Genie Francis) and Felicia Scorpio (Kristina Wagner) brainstormed about a way to draw Ryan to Port Charles their way and on their timetable, and Felicia agreed that if Ryan became jealous thinking Ava had another man, that would more than likely do it! What better man to make Ryan jealous than his own twin, Dr. Kevin Collins (Jon Lindstrom)! 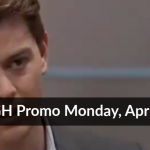 Other General Hospital spoilers tease that Ava may make a few other tries with male friends of hers but will be turned down; after all, what man wants to be bait for Ryan Chamberlain? Thank goodness Franco Baldwin (Roger Howarth) is off the market, otherwise, he’s probably the first one she would ask! She may even have the nerve to ask Jason Morgan (Steve Burton), who wouldn’t be out of her age range, but he’s too busy trying to save Kristina Corinthos-Davis (Lexi Ainsworth) right now. He may, in fact, try to talk her out of her plan, saying it’s much too dangerous if she does ask him. But Jason probably would be the first to agree with her that considering the circumstances, Ryan would cut off his own hand to make the police think he’s dead! Ryan apparently hasn’t gotten a chance to study modern forensics enough to know that the authorities could tell if a hand was amputated post mortem or while the person was still alive! But having a pretend hot romance with Jason or anyone else would not inspire jealousy, was Ryan to hear of it, more than Kevin! What an affront to Ryan’s pride that would be; after all, Ryan, the narcissist that he is, considers himself to be much more of a catch than his boring twin, even though other than the now missing hand, the two are identical in appearance! Stay tuned to General Hospital and check General Hospital spoilers frequently for all the latest news, developments in ongoing storylines, and spoilers! General Hospital Rumor: Neil Brings Kristina Back To Her Sense, Alexis Stunned – Is She Faking?